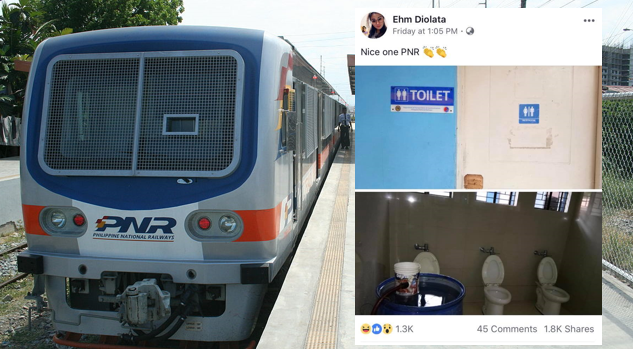 Netizen took a photo inside the toilet of PNR Espana and posted on Facebook that went viral after the people saw the surprising set-up of the can bowls. Clearly, there was no distinct divider in the middle of each. The photo was uploaded with a sarcastic caption. “I wasn’t aware that my post about the toilet in PNR Espana Station has reached 1.8k shared already. My post was not meant to humiliate any person or government body. T’was merely for fun, and out of concern as well. I am a PNR commuter since I was a child. I’m a proud Batang Riles, Batang Sta Mesa. That day was the first time I saw a toilet inside a PNR Station. Malinis ang toilet, pero walang divider and tatlong urinal bowl na naka-install. Nakakaproud Makita ang improvements ng PNR from their ticketin system to the newly built stations, to the very accommodating staff. Dioleta was shocked to see that the photo she uploaded gets nearly 2K shares on Facebook and created a significant buzz in social media, people asking her to clarify it on Facebook. OKBK Toilet Facilities were one of the undertakings of DOTC in 2012 according to PNR GM Junn Mango. The project was separately produced by DOTC, the venture was not actualized because of the absence of management even after the end of the term of the past administration. In the past administration has been connected with projects that are not that successful or strange. A perfect example would be the Southern Leyte project which was called “bridge without a river”. The DPWH claimed that the bridge was constructed over a fault line, only to find out that there are no proof signifying that there is a fault in the place according to Mines and Geosciences Bureau Chief geologist Valentine Narido.